Festival No. 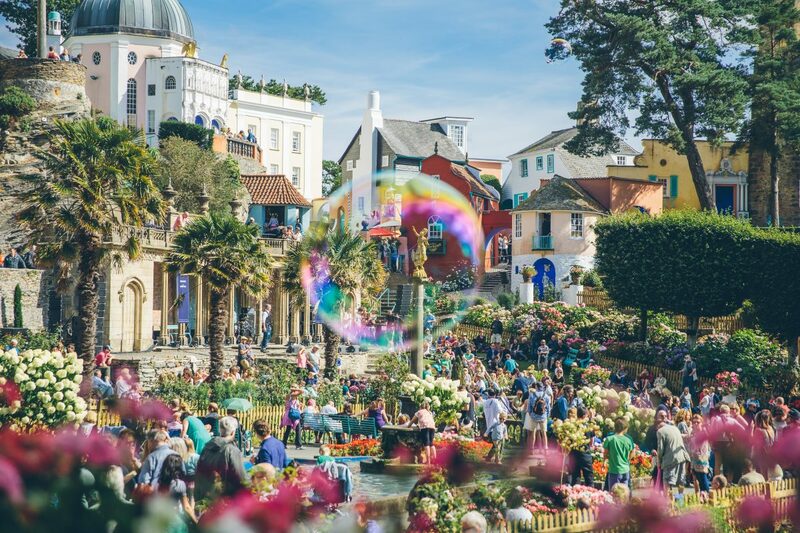 6 is one of the musical highlights of the summer and Getintothis has teamed up with organisers once again to offer readers a pair of tickets to the event in picturesque Portmeirion. Festival No. 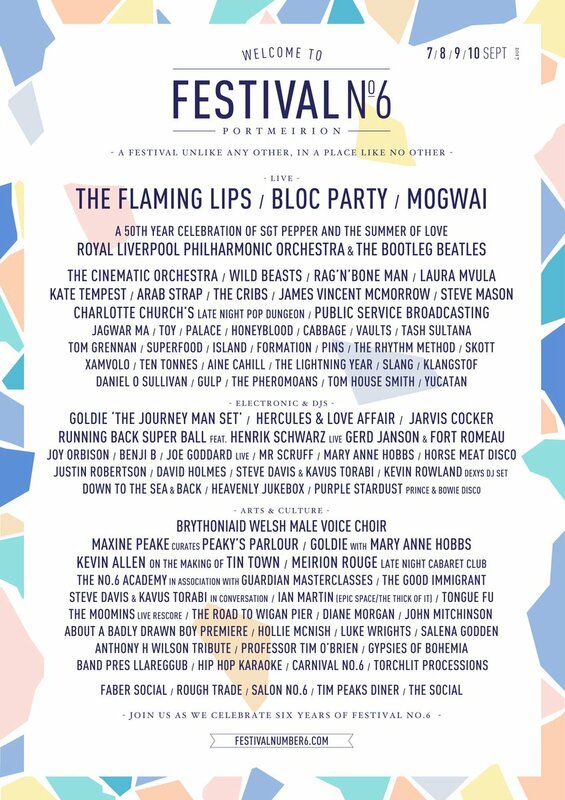 6, set in picturesque Portmeirion, has served as the bookend to the summer festival season, boasting memorable performances from the likes of Grace Jones, Manic Street Preachers, Primal Scream, Belle and Sebastian and Hot Chip among many others. This year’s festival offers up another heavyweight line up with The Flaming Lips, Mogwai and Bloc Party topping the expansive and eclectic billing. Other bands playing the 4-day event include Wild Beasts, Rag’N’Bone Man, Laura Mvula, Arab Strap, The Cribs, Steve Mason, Public Service Broadcasting, Jagwar Ma, Goldie and the irrepressible Jarvis Cocker. Elsewhere, the Royal Liverpool Philharmonic Orchestra team up with the Bootleg Beatles for a special performance of Sgt Pepper on this its 50th year while Tim Burgess collates the finest new music offerings in his customary Tim Peaks. As is characteristic of No. 6 the festival has once again triumphantly celebrates its Welsh roots, announcing a distinguished and diverse line up from the Welsh music spectrum. Returning to Festival No. 6 for its fourth year, Horizons, BBC Wales and Arts Council Wales’ music project, opens the Lost in the Woods stage on Friday; hosting acts nominated by BBC Wales’ specialist music radio DJs and producers. Acts include Llangollen-based Campfire Social, Wrexham’s indie-pop sensation Kidsmoke, Cardiff’s art-rock theatrics of Palomino Party, Caernarfon’s psychedelic favourites Castles, post-rock girl group Adwaith, electro-pop maverick Griff Lynch, folk rock duo Zervas & Pepper, anthemic rock from Climbing Trees, blues-tinged indie rockers Candelas and Sweet Baboo – who recently released his first out of a three part trilogy studio album, Wild Imagination. Keen to build on the success of last year, Welsh music specialists Huw Stephens and John Rostron from Sŵn Festival based in Cardiff have curated a bespoke mix of Welsh artists and collaborators. Saturday’s highlights include electronic pop musician and producer Ani Glass, Argrph, Chroma, DJ Elan Evans, rising Welsh artist Greta Isaac, Lastig Band, sets by Swn DJ’s, Toby Hay and Twinfield. Love festivals? Check out our Festival Guide 2017 to see what’s on, when! With more incredible acts, DJs, happenings, activities and installations still to be announced the special sixth edition of Festival No.6 will be truly unmissable. We want to make sure you don’t miss out, so Getintothis is giving away a pair of tickets for this year’s event, taking place 7-10 September. To enter, simply like the Getintothis Facebook page, share the post below and tag in two of your friends. Easy. Good luck.